Thirteen-year-old Egg lives on the impoverished island of Deadweather with his uncaring father and vicious siblings. His family have always treated him badly, blaming him for the death of their mother, who died in childbirth. They barely scratch a living on the family plantation, their only help a bunch of useless pirates. 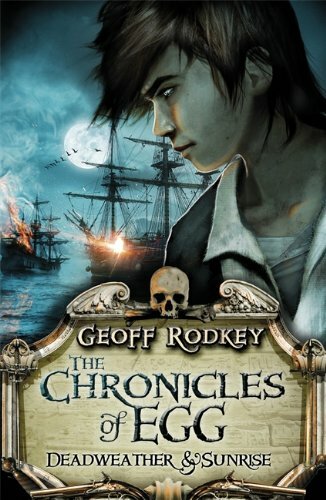 Then one day his father announces with much urgency that they are to journey to the glorious island of Sunrise, where they happen upon the charming Roger Pembroke, a wealthy businessman. With much flattery, Pembroke promptly invites them to his luxurious mansion, and Egg falls headlong in love with his feisty daughter Millicent. But Egg’s newly found happiness turns to nightmare when, after his father and siblings suffer a fatal accident, Pembroke turns vicious. An Emmy nominated screenwriter, Geoff Rodkey knows how to spin a good yarn. The story, the first in a series, begins slowly setting the scene for much swash-buckling action and high drama as Egg escapes one ambush after another and solves the puzzle of why his father went to Sunrise in the first place. Fast-paced and exhilarating, teeming with surprising characters, both evil and good, and moving across pirate-infested land and seas, the story ends on a high note with elements in place for the next book in the series.